There are at least superficial reasons for thinking that Zhu Xi’s epistemology is significantly influenced by Chinese Buddhism. For one thing, in his youth Zhu studied with Kaishan Daoqian 開善道謙 (d. 1150? ), a leading disciple of the most influential Chan teacher of the era, Dahui Zonggao大慧宗杲 (1089-1163). For another, his discussions of epistemology lean heavily on terms like “genuine knowing 真知” that also figure significantly in Buddhist discussions. As is well known, subsequent critics of the Daoxue movement with which Zhu was centrally associated regularly accused it of being strongly colored by Buddhism. Finally, modern scholars have also drawn similar connections, whether of a general nature or more focused on Zhu Xi and epistemology. The present essay explores the relation between Buddhism and Zhu’s epistemology in three steps. First, I will spell out the four layers of Buddhist–Confucian interactions that collectively shape the ways in which Zhu was influenced by and reacted to Buddhism. Second, I will summarize distinct Chinese Buddhist approaches to the question of “knowing 知” and look in particular at the roles played in these different approaches by epistemic terms and categories that will eventually be important to Zhu Xi. 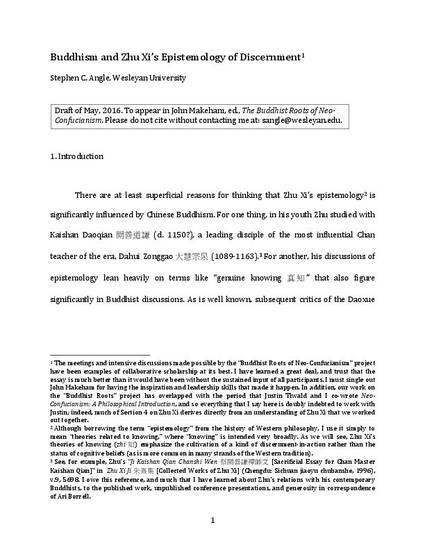 Finally, I will spell out the rough parameters of what I call Zhu’s epistemology of discernment so that we can look for specific ways in which Zhu is appropriating and, more explicitly, rejecting particular aspects of Buddhist epistemic thinking. My conclusion is that despite the many layers of Buddhist influence on both Daoxue in general and Zhu Xi in particular, Zhu correctly understood his epistemology to be a rejection of Dahui’s radical Chan approach. More generally, Zhu Xi’s epistemology does not coopt the Buddhist structure seen, for example, in the Buddhist Zongmi, but is importantly different, responding to a distinct discourse context which, while getting some of its underlying shape from the shared discourse, has quite distinct concerns and goals. In particular, in the concluding section I review five issues: the structured nature of our deepest knowing; the necessity of cultivation; the continuity between empirical and genuine knowing; the role of inherence; and the role of commitment or faith.